When the owners bought their century old cottage in 2010, they decided to keep as much of the charm, rooflines, stone fireplace as possible. When finished they had incorporated the old with the new, enjoying 2250 square feet of treasure. 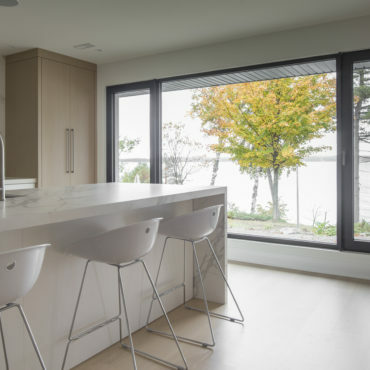 Conscious of the cottage’s original viewlines, roof structure and community building guidelines, they now enjoy a beautiful balance of old and new. This cottage gives a feeling of seclusion and restfulness. It incorporates the common feature of Georgian Bay cottages… the porch. Only, this porch is incorporated into the entire cottage. Big Glass Openings completed the design and installation of the 16 by 7 foot bifolding door (CF-77) to open the space, capture a unique view of rocky landscape, open waters and windswept trees. The doors also provide exceptional weather protection against the gale force winds, rain and snow of Georgian Bay. BGO understands the challenges of water-access vacation homes. The BGO team provides top level service to meet demanding barge deadlines and their clients’ design requirements. Reynaers’ profiles and diverse colour options enhanced the overall look. With their beautiful, expansive view and protection from whatever Georgian Bay winds throw at them, this couple plans their cottage to be there for many generations.